Here it is Friday and I'm just getting around to posting about last weekend! This week Caleb and I have both been sick with colds + we've had a really busy week with work and life. Last weekend my parents came down to visit for the weekend, and my sister and her three kids also came up for a day. We had fun playing at the playground with the kids and also having adult conversation with my sister and parents. 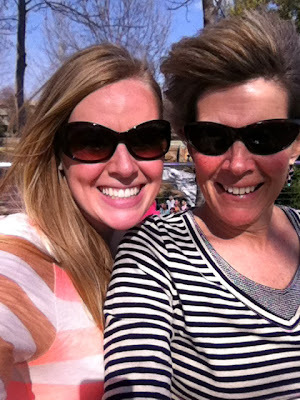 After my sister left on Saturday, we headed downtown with parents along with everyone else in town to enjoy the beautiful WARM weather! The park by the river was filled with picnics and people and it made me so excited for the arrival of spring. Sunday afternoon I even got a little touch of sunburn reading out on our back deck. Fast forward to the end of the week: we have frost on our cars, and we both have colds. BUT I'm holding onto last weekend as my hope for spring. Happy Friday! Awww love the photo of Caleb with the girls sucking their thumbs...too cute! Glad you got enjoy the warmer weather! I love all of these pictures! I never thought it before, but you and your mom look so much alike in that picture! I'm glad you were able to get out and enjoy the warm weather before you got sick. Hope you feel better soon! I hope my girls never lose those chubby hands...Thanks for having us last weekend!